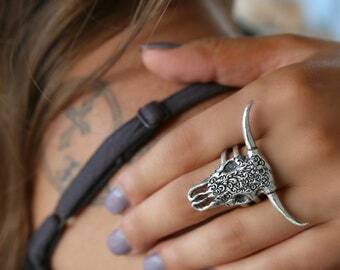 Boho Jewelry, Bohemian Longhorn Steer Skull Ring: This floral carved longhorn steer skull is handmade in sterling silver and spans 3 of your fingers for a dramatic boho chic impact. It is specially made to rest securely in place as it sits atop a split shank band for stability. The body & horns are slightly curved to fit your hand perfectly and offer a spectacular 3 dimensional effect. 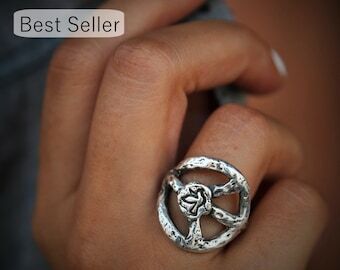 It is surprisingly extremely comfortable, a total delight to wear, and adds an instant cool bohemian flair to any outfit. 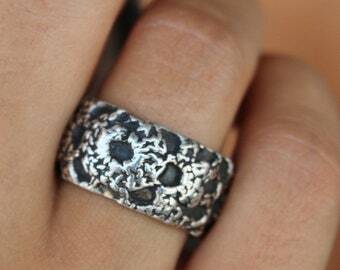 This striking ring packs a real punch with its edgy allure of the rugged skull juxtaposed with a feminine floral design in captivating detail. 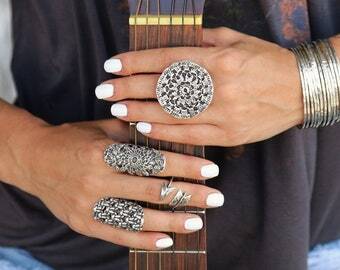 You can't help but stand out wearing this unique HappyGoLicky original ring. 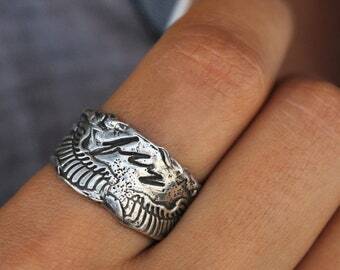 For a funky, boho, rockabilly, cowgirl look it could easily become your new favorite ring. As you can see from the last photo the band is open ended in the back for slight adjustability to push over knuckles, or wear on different fingers. Please take caution as sterling silver is durable but not indestructible, and adjusting more than ONE full ring size WILL cause damage or breakage, so please treat respectfully as you would any fine jewelry. The horns measure about 1 3/4 inches (45mm) wide and it is 1 1/4" (35mm) tall. The split shank (please see last photo) is about 5mm wide at the smallest point where it is cut for adjustability. Measurement are ESTIMATES ONLY since each ring is made by hand and will vary. The horns are not sharp but they are pointy. Skull Necklace is NOT included but can be purchased in our shop. >>> This listing is for ONE steer skull ring. <<< Other jewelry is shown as examples of our work, offered for layering and stacking inspiration, and can be purchased in our shop. See links below.